Colours mix and combine, different yarns form intricate motifs while geometrical lines criss-cross creating neon futurscapes: the 31 knitwear pieces devised by fashion designer Angelo Figus and knitwear expert Nicola Jane Miller are a joy to the eye. The pieces - displayed during Florence's Pitti Filati 70 in an installation entitled “Futurural” - are a call for a return to a rural environment conceived as the repository of an entire world of values, encompassing quality, genuine materials and visually enticing aesthetics. Each piece is an exciting tactile experience, an entire world intricately designed that mixes different inspirations, yarns, stitches and techniques selected by Miller. Yet Figus and Miller's rural world is definitely not a bucolic one nor it revolves around the “Worker and Kolkhoz Woman” aesthetic: some of the knits included are indeed characterised by vibrantly vivid Techno-Bauhaus motifs, with neon-coloured fibres including cotton, rayon and polyester mixed with plastic-based materials to remind the fashion fan and the trendsetter visiting the installation that Figus and Miller's knit-clad peasants are completely projected into the future and ready to face up new technological challenges. Dazed Digital: What inspired you the theme for this installation? Angelo Figus: We wanted to come up with a theme that wasn't conceptual and that celebrated a return to a rural environment interpreted as a return to a simple lifestyle, but also to labour and industry. The installation reunites four sub-themes together: 'Ruralscape', with strong colours forming floral motifs and effects that remind of cultivated lands; 'Futurfarm', with inspirations that move from cattle and animals translated in the various designs through cotton and nylon combined with leather and furry materials; 'Sunday', a third theme inspired by festival celebrations with dummies wearing scarves on their heads and linen garments matched with elaborate knits incorporating embroideries representing specific foods you would eat on a Sunday, and 'A-Mish', a theme that moves from the Hamish community but is combined with rigorous and colourful geometries in techno shades. DD: Famous Italian manufacturers – including Zegna Baruffa, Linea Più and Toscano - provided you with the yarns for this installation, what was your selection criteria? Nicola Jane Miller: I do not have a favourite manufacturer as each of them produces different yarns, from cashmere and silk to blends, but I do ask each manufacturer who comes to Pitti Filati to provide me with their colour cards and then I start choosing the yarns according to the nuances and to the main material employed to make them. DD: How long does it take to create such an installation? Nicola Jane Miller: Around six months. We have to put together the yarns and the colours, work on the embroideries, the prints, the jacquards and the intarsia motifs. I would say that making the actual pieces is the very last step of this process. We make the pieces with the help of students and professionals. In previous installations we worked with students from the Florence-based Polimoda institute, this time instead we had students from London's Royal College of Art. Even though the students' work is in a way more free, it's always made under our guidance and inputs. A second stage is then carried out by professionals. DD: While putting together this installation, did you ever feel you were actually creating a proper collection? Angelo Figus: In terms of time frames, yes, it felt a bit like doing a collection, but our idea is not to give just one vision, but provide visitors with a wide range of inputs that could be used by them in different ways. DD: What's the future of this installation? Angelo Figus: There will be an online archive where people will be able to look at the pieces, but we do hope that they will be sent again to other exhibition spaces all over the world as it happened with previous installations that went to Shanghai, Tokyo or Antwerp. 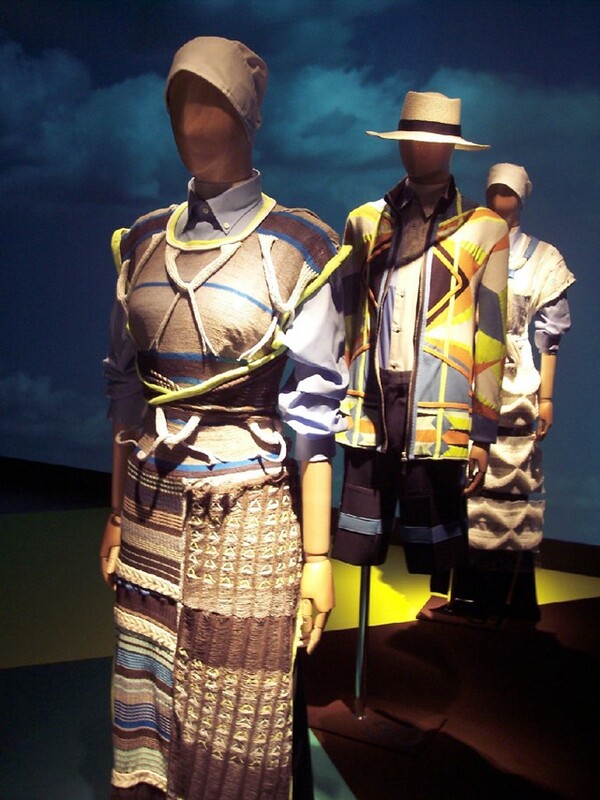 An installation we did years ago for Pitti Filati was actually part of the “Unravel” exhibition at Antwerp's MoMu.